SOUTH BEND, Ind. 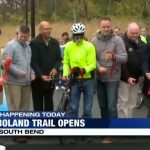 (WNDU) – South Bend Mayor Pete Buttigieg and representatives from the city of South Bend marked the completion of the new Boland Trail with a ribbon-cutting. Boland Trail will serve as an extension of the Riverwalk Trail that runs along the north side of Boland Drive, providing a needed connection from the Riverwalk Trail to Portage Avenue. Residents say the new trail is important because it gives them another safe route to travel when bicycling in the city. “Bike trails and lanes don’t help too much if they are orphans and you’ve come to the end of the lane and there’s no place to go that’s safe,” Chris Vandenbossche said. 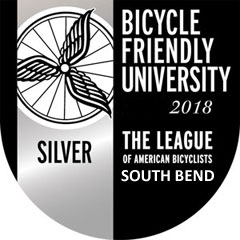 “So, this gives us another way to connect between places so you can get anywhere in South Bend safely on your bicycle.” New improvements to the trail include a pedestrian crossing flasher at the corner of Riverside and Boland drives, as well as two benches and 27 lights. Indiana State Police and Michiana Bike Coalition talk about safety with bikes on the road What will you say of the 3 proposed names, logos for Michiana trails?